Since California has so much oceanfront, desalination may seem like a no-brainer to increase water supply. But there are a few things that are important to understand about why it’s not always the best solution. 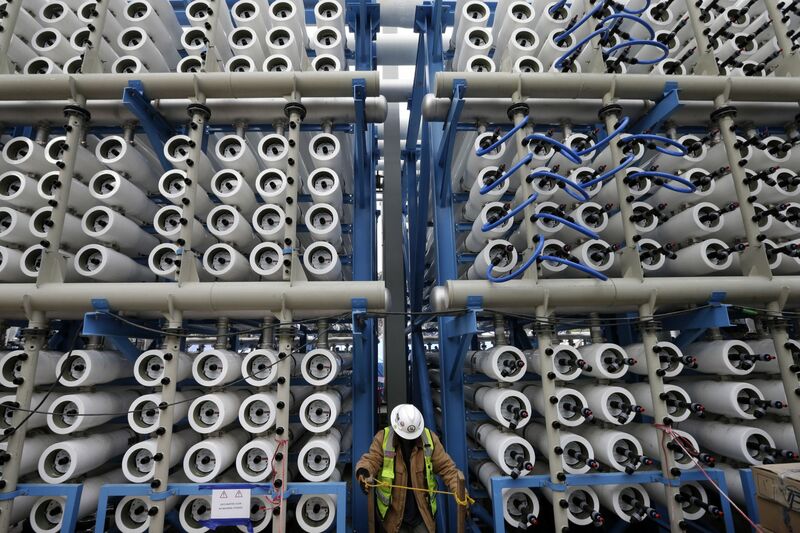 Could desalination provide a reliable supply of water for California? A number of policy makers have been raising this question in response to water-supply challenges brought on by the drought. The Pacific Ocean provides the “reservoir,” and the technology has continued to improve. Around the globe, some similarly dry places are getting a significant share of their water through desalination. So is it a viable, practical water supply for California? Officials in some cities, especially in Southern California, certainly think so and are taking steps to develop desalination plants. The state’s water bond, approved by voters in 2014, allocates $725 million to help local water agencies build water recycling and desalination plants. Other recent proposals also prioritize desalination, including Sen. Dianne Feinstein’s proposed water bill, which would reauthorize the Desalination Act of 1996 by providing $100 million in federal funds for research, design and construction of desalination projects; Assembly Bill 1925 by assemblywoman Ling Ling Chang, which would establish annual goals for the production of potable water through desalination; and the Obama administration’s proposed budget for 2017, which would launch an Energy-Water Desalination Hub and provide funding for other desalination initiatives. California has more than 60 years of experience with desalination, and yet the process remains a minimal part of the state’s water system, for a number of reasons. Here are some key facts about desalination in California today. 1. It’s not just about the ocean: Although desalination often uses seawater, in California and other western states, it has mostly been used to remove salt from brackish waters – which are saltier than freshwater but fresher than seawater. Some waters are naturally brackish; others become brackish because of human activity, such as irrigation or indoor urban uses. In 2013, the Department of Water Resources reported that the state’s capacity for desalination in existing plants was almost 140,000 acre-feet (172.6 million cubic meters) from brackish sources, but only 562 acre-feet (700,000 cubic meters) from seawater. (This latter number jumped to almost 57,000 acre-feet (70 million cubic meters) with the 2016 opening of the Carlsbad desalination plant near San Diego.) Some inland Southern California cities already rely on desalted brackish groundwater as a major component of their supplies. Brackish water from Mallard Slough in Contra Costa County would diversify the supply portfolio of five major San Francisco Bay Area water utilities if the Bay Area Regional Desalination Project were built. 2. Seawater desalination will remain an expensive source of water: The processes, costs, energy usage, environmental impacts and greenhouse gas emissions of removing salts from water depend on the quantity of salt in the water. Current costs of large seawater desalination plants such as the one in Carlsbad are over $2,000 per acre-foot of water, compared to as little as $600 per acre-foot for desalinating brackish water. According to a recent report by the White House, current seawater desalination technologies will need to undergo a fourfold reduction in cost, a threefold decrease in electricity usage and a twofold cut in carbon-dioxide emissions to effectively compete with traditional water sources. Even with such ambitious improvements, the estimated cost will be more than $600 per acre-foot – still a high price relative to most other sources available in California. Ocean desalination will hardly ever be affordable for most agricultural uses, and reductions in costs are still needed to make desalination of brackish water work for most farms. 3. California’s water supply varies from year to year, while desalination is a fixed, long-term investment: Desalination can provide a reliable water source that is unaffected by climatic variability. But customers will also have to pay the higher costs for investments in desalted water in wet years when cheaper sources are available. At this point, seawater desalination makes the most sense for those utilities that cannot meet long-term local demands or those unable to obtain reliable water from cheaper sources during droughts. This is the case for some cities in Southern California and the Central Coast. 4. California has not invested in desalination as much as some other places because we have relatively abundant supplies from other sources. Even in times of drought, California has many water sources that can carry it through long, dry periods. We also have an extensive infrastructure network that enables us to share water both within and across regions. This gives us a lot of flexibility to get through droughts compared to places like Israel, which is naturally very dry, and Australia, where some coastal cities are not well connected to statewide infrastructure. 5. Environmental impacts are a concern. The most significant impacts are associated with the effects of the water intake and brine disposal on marine life. Brine disposal is also an environmental and economic challenge in inland plants. The high energy-intensity of desalination processes compared with other sources of water brings climate change concerns. A drought is a bad time to rush into investments in desalination to solve water supply problems that can be solved more effectively in other ways. We would do well to learn from the successes and mistakes in other places that have turned to desalination in dry times. Many desalination plants that were prompted by droughts – including plants in Australia, Spain and here at home in Santa Barbara – either never were used or closed within a few years of operation because their high-cost water could not be justified once the rains returned. Desalination is clearly not a silver bullet for California, but it is one tool to consider for communities facing long-term water insecurity. Alvar Escriva-Bou is a research fellow at the PPIC Water Policy Center. His research explores integrated water, energy and environmental resources management. He holds a Ph.D. and M.S. in water and environmental engineering and a B.S. in civil engineering from the Polytechnic University of Valencia in Spain, as well as an M.S. in agricultural and resource economics from the University of California, Davis.